But what was most chilling to Herzl was not so much the cruelty of the ceremony as the reaction of the Paris mob that had gathered to watch. Baying for the blood of the innocent man, cries of “Death to the Jews!” rang out in the historic site. Opinion: As the world approaches the final wars of this age, prophecy watchers look for clues as to where we are on the Bible’s timeline. One of the most startling of all is the global rise of anti-Semitism, reminiscent of pre-World War II Germany and Hitler’s final solution. As in Theodore Herzl’s time, God will turn this hatred of His people to good as prophesied in that last sentence: “But he shall be saved out of it”. Matthew 24:9 confirms that “those Jews who survive to the end of the tribulation will acknowledge Jesus (Zechariah 12:10), and be saved. But what about those yellow vests? 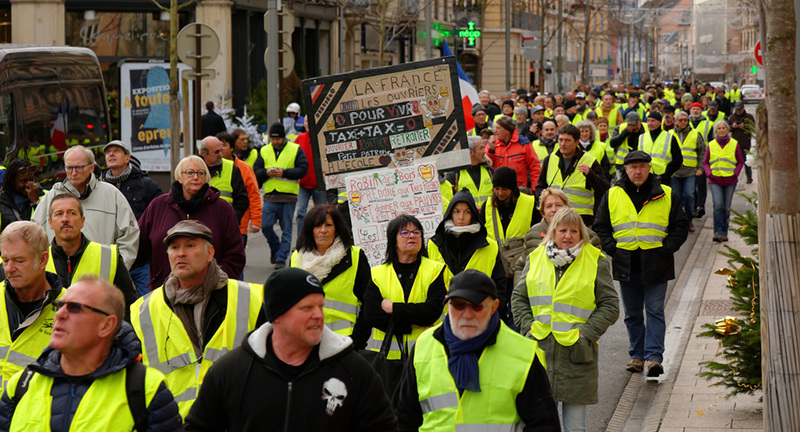 “Those who took to the streets wore the gilets jaunes, or yellow high-visibility vests that French citizens are required to keep in their cars in case of emergencies. They were angry at Macron, who only a year after being elected president in a landslide victory for his new technocratic centrist movement is already in big trouble. He’s been denounced as the “president of the rich” for his high-handed green policies that is hitting the middle class hard and was forced to rescind the tax. The clues are all around us for all who care to open their eyes.